Miguel de Cervantes Saavedra (September 29, 1547 – April 22, 1616) was a Spanish novelist, poet and playwright, best known for his beloved Don Quixote, widely considered to be the first modern novel, the greatest novel in the Spanish language, and one of the most influential and enduring works in Western literature. Before Cervantes, there was little European literature which could readily be identified within the genre of the novel. Medieval literature had notable examples of chivalric romance and allegory, and Cervantes' great predecessors Geoffrey Chaucer and Giovanni Boccaccio each wrote colorful, realistic tales of contemporary life that employed subtle literary techniques. Cervantes' Don Quixote, in contrast, was a revolutionary accomplishment, a sustained fictional narrative of more than one thousand pages that demonstrates a command of novelistic art that is little short of miraculous. Cervantes infuses the story of the befuddled Don Quixote and his imagined chivalric adventures with a combination of pathos, riotous comedy, fast-paced action, and scrupulously realistic character portrayal—primarily the archetypal Don Quixote and his faithful, credulous companion, Sancho Panza. In the context of twentieth-century fiction, Cervantes employs astonishing post-modern devices, blurring the narrative voice and obscuring the line between fiction and commentary. Above all, Cervantes informs the novel with wisdom, insight into human psychology, and profound sympathy for humanity, despite its foibles. With his younger contemporary William Shakespeare, who read Don Quixote and adapted the story for his lost play Cardenio, Cervantes is considered one the founders of early modern literature, concerned with the thoughts and mores of not just great men, but the common man as well. As with Shakespeare's plays for the London stage, Cervantes' work was accessible to the common Spaniard, while appealing to the most discriminating literary tastes. Cervantes' satire of popular chivalric literature—which so intoxicated Don Quixote as to convince him that he was a medieval knight errant—launched a four-century tradition of comic satiric novels beginning with Henry Fielding (who credited Cervantes as the inspiration behind his picaresque novels Tom Jones and Joseph Andrews), and influencing later comic writers such as William Thackeray, Charles Dickens, Nikolai Gogol, Mikhail Bulgakov, and Joseph Heller, among many others. Directly or indirectly, all later novelists are indebted to the genius of Cervantes. Cervantes was born at Alcalá de Henares, Spain, north of Madrid. The exact date is not known, but it has been surmised that since he was named Miguel he might have been born on the feast day of Saint Michael (September 29) in 1547. He was the second son and fourth of seven children of Rodrigo de Cervantes and Leonor de Cortinas. His father was an impoverished apothecary-surgeon and came from an old family of Northern Spain. Cervantes was baptized on November 9, 1558. Although Cervantes' reputation rests almost entirely on his portrait of the gaunt country gentleman, El ingenioso hidalgo, his literary production was considerable. As a child, Cervantes saw the famous actor-manager and dramatist Lope de Rueda and mentions this in the preface to his plays. This possibly ignited his passion for the theater in later life. Cervantes lived an unsettled life of hardship and adventure. He was the son of a surgeon who presented himself as a nobleman, although Cervantes's mother seems to have been a descendant of Jewish converts to Christianity. Little is known of his early years, but it seems that Cervantes spent much of his childhood moving from town to town, while his father sought work. After studying in Madrid from 1568 to 1569, where his teacher was the humanist Juan López de Hoyos, Cervantes went to Rome in the service of Giulio Acquavita. Once in Italy, he began to familiarize himself with Italian literature, which figures prominently in his own works. In 1570 he became a soldier, and fought bravely on board a vessel in the great Battle of Lepanto in 1571. He was shot through the left hand and he never had the entire use of it again. He had recovered sufficiently however to participate in the naval engagement against the Muslims of Navarino on October 7, 1572. He participated in the capture of Tunis on October 10, 1573, and the unsuccessful expedition to the relief of La Goletta in the autumn of 1574. After living a while longer in Italy, with periods of garrison duty at Palermo and Naples, he finally determined to return home in 1575. The ship was captured by the Turks, and he and his brother, Rodrigo, were taken to Algiers on the Barbary Coast as slaves. In a stroke of good fortune, Cervantes was in possession of a letter of recommendation from the Duke of Alba, on whose ship he served. The letter was found on his person and the Turks took him for a man of some importance who might bring a hefty ransom, sparing him from execution. He was held captive for five years, undergoing great suffering, since his family could not afford the overpriced sum. Some of these experiences seem to have filtered into the episode of the "Captive" in Don Quixote, and in scenes of the play, El trato de Argel. After four unsuccessful escape attempts, he was ransomed by the trinitarians, and returned to his family in Madrid in 1580. In 1584, he married Catalina de Salazar y Palacios, 22 years his junior. He and Catalina had no children, although two years before his marriage Cervantes had fathered an illegitimate daughter, Isabel, in an affair with Ana Francisca de Rojas. During the next 20 years he led a nomadic existence, working as a purchasing agent for the Spanish Armada, and as a tax collector. He was temporarily excommunicated from the church for confiscating supplies which belonged to the dean of the cathedral of Seville. He suffered a bankruptcy, and was imprisoned at least twice in 1597 and again in 1602 because of irregularities in his accounts, although once it appears to have been due to misappropriation by a subordinate. Between the years 1596 and 1600, he lived primarily in Seville. In 1606, Cervantes settled permanently in Madrid, where he remained for the rest of his life. In 1585, Cervantes published his first major work, La Galatea, a pastoral romance, at the same time that some of his plays, now lost except for El trato de Argel which is about the lives of Christian slaves in Algiers and El cerco de Numancia, were playing on the stages of Madrid. La Galatea received little contemporary notice, and Cervantes never wrote the promised second part. Cervantes next turned his attention to drama, hoping to derive an income from that genre, but the plays which he composed—while clever—were widely unpopular. Aside from his plays, his most ambitious work in verse was Viaje del Parnaso (1614), an allegory which consisted largely of a rather tedious though good-natured review of contemporary poets. Cervantes himself realized that he was deficient in poetic gifts. According to it prologue, the idea for Don Quixote occurred to him in prison at Argamasilla, in La Mancha. Cervantes' purpose was to give a picture of real life and manners, while expressing himself in clear, everyday language. This intrusion of common speech into a literary context was acclaimed by the reading public, but the author remained poor until 1605, when the first part of Don Quixote appeared. Although it did not make Cervantes rich, Don Quixote brought him international fame as a man of letters. Cervantes also wrote some plays during this period, as well as several short novels. 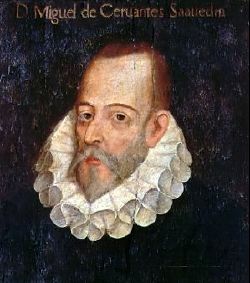 The vogue that Cervantes' story achieved led to the publication of a second part by an unknown writer, masquerading under the name of Alonso Fernández de Avellaneda. To protect his interests, Cervantes produced his own second part, which made its appearance in 1615. Surer of himself, this part does not feature extraneous plots, and is generally considered to be of higher literary merit than the first part. In 1613, he published a collection of tales, the Exemplary Novels, some of which had been written earlier. On the whole, the Exemplary Novels bear the same stamp of genius as Don Quixote. The picaroon strain, already made familiar in Spain by the Lazarillo de Tormes and his successors, appears in one or another of them, especially in the Rinconete y Cortadillo, which is the best of all. He also published the Viaje Del Parnaso in 1614, and in 1615, the Eight Comedies and Eight New Interludes, the largest group of plays written by Cervantes to have survived. At the same time, Cervantes continued working on Los trabajos de Persiles y Sigismunda, a Byzantine novel of adventurous travel completed just before his death, and which appeared posthumously in January 1617. Cervantes reportedly died in Madrid on April 23, 1616, (Gregorian calendar), the same date of the death as William Shakespeare (in the Julian calendar), although the Encyclopedia Hispanica claims the date on his tombstone would have been his date of burial, in accordance with the traditions of Spain at that time. If this is true, according to Hispanica, then it means that Cervantes probably died on April 22 and was buried on April 23. La Galatea (1585), a pastoral romance in prose and verse based upon the genre introduced into Spain by Jorge de Montemayor's Diana (1559). Its theme is the fortunes and misfortunes in love of a number of idealized shepherds and shepherdesses, who spend their life singing and playing musical instruments. Los trabajos is the best evidence not only of the survival of Byzantine novel themes but also of the survival of forms and ideas of the Spanish novel of the second Renaissance. In this work, published after the author's death, Cervantes relates the ideal love and unbelievable vicissitudes of a couple who, starting from the Arctic regions, arrive in Rome, where they find a happy ending for their complicated adventures. Don Quixote is universally regarded as Cervantes' masterwork and one of the greatest novels of all time, as well as the first novel in the Western literary canon. The novel is actually two separate books that cover the adventures of Don Quixote, also known as the knight or man of La Mancha, a hero who carries his enthusiasm and self-deception to unintentional and comic ends. On one level, Don Quixote is a satire of the romances of chivalry which ruled the literary environment of Cervantes' time. However, the novel also allows Cervantes to illuminate various aspects of human nature by using the ridiculous example of the delusional Quixote. Because the novel—particularly the first part—was written in individually-published sections, the composition includes several incongruities. In the preface to the second part, Cervantes himself pointed out some of these errors, but he disdained to correct them, because he conceived that they had been too severely condemned by his critics. Cervantes felt a passion for the vivid painting of character, as his successful works prove. Under the influence of this feeling, he drew the natural and striking portrait of his heroic Don Quixote, so truly noble-minded, and so enthusiastic an admirer of every thing good and great, yet having all those fine qualities, accidentally blended with a relative kind of madness; and he likewise portrayed with no less fidelity, the opposite character of Sancho Panza, a compound of grossness and simplicity, whose low selfishness leads him to place blind confidence in all the extravagant hopes and promises of his master. The subordinate characters of the novel exhibit equal truth and decision. A translator cannot commit a more serious injury to Don Quixote than to dress that work in a light, anecdotal style. The novel is written in the kind of heroic prose perfectly fitting for the sort of knight Quixote dreams himself to be. It is precisely this solemnity of language that imparts a characteristic relief to the comic scenes. It is the genuine style of the old romances of chivalry, improved and applied in a totally original way; and only where the dialogue style occurs is each person found to speak as he might be expected to do, and in his own peculiar manner. But wherever Don Quixote himself harangues the language re-assumes the venerable tone of the romantic style; and various uncommon expressions of which the hero avails himself serve to complete the delusion of his covetous squire, to whom they are only half intelligible. This characteristic tone diffuses over the whole a poetic coloring, which distinguishes Don Quixote from all comic romances on the ordinary style; and that poetic coloring is moreover heightened by the judicious choice of episodes and interludes throughout the course of the novel. The essential connection of these episodes with the whole has sometimes escaped the observation of critics, who have regarded as merely parenthetical those parts in which Cervantes has most decidedly manifested the poetic spirit of his work. The novel of El Curioso Impertinente cannot indeed be ranked among the number of these essential episodes but the charming story of the shepherdess Marcella, the history of Dorothea, and the history of the rich Camacho and the poor Basilio, are unquestionably connected with the interest of the whole. These serious romantic parts—which are not essential to the narrative connection but strictly belong to the characteristic dignity of the whole picture—also prove how far Cervantes was from the idea usually attributed to him of writing a book merely to excite laughter. The passages, which common readers feel inclined to pass over, are, in general, precisely those in which Cervantes is most decidedly a poet, and for which he has manifested an evident predilection. On such occasions, he also introduces among his prose, episodical verses—for the most part excellent in their kind and no translator can omit them without doing violence to the spirit of the original. Were it not for the happy art with which Cervantes has contrived to preserve an intermediate tone between pure poetry and prose, Don Quixote would not deserve to be cited as the first classic model of the modern romance or novel. It is, however, fully entitled to that distinction. Cervantes was the first writer who formed the genuine romance of modern times on the model of the original chivalrous romance that equivocal creation of the genius and the barbarous taste of the Middle Ages. Don Quixote is, moreover, the undoubted prototype of the comic novel. The humorous situations are, it is true, almost all burlesque, which was certainly not necessary, but the satire is frequently so delicate, that it escapes rather than obtrudes on unpracticed attention. The language, even in the description of the most burlesque situations, never degenerates into vulgarity; it is on the contrary, throughout the whole work, so noble, correct and highly polished, that it would not disgrace even an ancient classic of the first rank. La Galatea, the pastoral romance, which Cervantes wrote in his youth, is a happy imitation of the "Diana" of Jorge de Montemayor, but exhibiting a still closer resemblance to Gil Polo's continuation of that romance. Next to Don Quixote and the Novelas exemplares, his pastoral romance is particularly worthy of attention, as it manifests in a striking way the poetic direction in which the genius of Cervantes moved even at an early period of life, and from which he never entirely departed in his subsequent writings. As, however, the Galatea possesses but little originality, it constantly excites the recollection of its models, and particularly of the Diana of Gil Polo. Of the invention of the fable, likewise, but little can be said, for though the story is continued through six books, it is still incomplete. In composing this pastoral romance, Cervantes seems to have had no other object than to clothe a rich collection of poems in the old Spanish and Italian styles in the popular garb of a tale. The story is merely the thread that which the poems together; for the poems are the portions of the work most particularly deserving attention. They are as numerous as they are various. It was remarked by the contemporaries of Cervantes that he was incapable of writing poetry, and that he could compose only beautiful prose; but that observation referred solely to his dramatic works. Every critic sufficiently acquainted with his lyrical compositions has rendered justice to their merit. From the romance of Galatea, it is obvious that Cervantes composed in all the various kinds of syllabic measure, which were used in his time. He even occasionally adopted the old dactylic stanza. He appears to have experienced some difficulty in the metrical form of the sonnet, and his essays in that style are by no means numerous; but his poems in Italian octaves display the utmost facility; and among the number, the song of Caliope, in the last book of the Galatea, is remarkable for graceful ease of versification. It would be scarcely possible to arrange the other works of Cervantes according to a critical judgment of their importance; for the merits of some consist in the admirable finish of the whole, while others exhibit the impress of genius in the invention, or some other individual feature. A distinguished place must, however, be assigned to the Novelas Exemplares (Moral or Instructive Tales). Cervantes seemingly intended that they should be to the Spaniards nearly what the novels of Boccaccio were to the Italians; some are mere anecdotes, some are romances in miniature, some are serious, some comic, and all are written in a light, smooth, conversational style. Four of them are perhaps of less interest than the rest: El Amante Liberal, La Señora Cornelia, Las Dos Doncellas and La Española Inglesa. The theme common to these is basically the traditional one of the Byzantine novel: pairs of lovers separated by lamentable and complicated happenings are finally reunited and find the happiness they have longed for. The heroines are all of most perfect beauty and of sublime morality; they and their lovers are capable of the highest sacrifices, and they exert their souls in the effort to elevate themselves to the ideal of moral and aristocratic distinction which illuminates their lives. In El Amante Liberal, to cite an example, the beautiful Leonisa and her lover Ricardo are carried off by Turkish pirates; both fight against serious material and moral dangers; Ricardo conquers all obstacles, returns to his homeland with Leonisa, and is ready to renounce his passion and to hand Leonisa over to her former lover in an outburst of generosity; but Leonisa's preference naturally settles on Ricardo in the end. Another group of "exemplary" novels is formed by La Fuerza de la Sangre, La Ilustre Fregona, La Gitanilla, and El Celoso Extremeño. The first three offer examples of love and adventure happily resolved, while the last unravels itself tragically. Its plot deals with the old Felipe Carrizales, who, after traveling widely and becoming rich in America, decides to marry, taking all the precautions necessary to forestall being deceived. He weds a very young girl and isolates her from the world by having her live in a house with no windows facing the street; but in spite of his defensive measures, a bold youth succeeds in penetrating the fortress of conjugal honor, and one day Carrizales surprises his wife in the arms of her seducer. Surprisingly enough he pardons the adulterers, recognizing that he is more to blame than they, and dies of sorrow over the grievous error he has committed. Cervantes here deviated from literary tradition, which demanded the death of the adulterers, but he transformed the punishment inspired by the social ideal of honor into a criticism of the responsibility of the individual. Rinconete y Cortadillo, El Casamiento Engañoso, El Licenciado Vidriera and El Diálogo de los Perros, four works which are concerned more with the personalities of the characters who figure in them than with the subject matter, form the final group of these stories. The protagonists are two young vagabonds, Rincón and Cortado; Lieutenant Campuzano; a student, Tomás Rodaja, who goes mad and believes himself to have been changed into a man of glass; and finally two dogs, Cipión and Berganza, whose wandering existence serves as a mirror for the most varied aspects of Spanish life. Rinconete y Cortadillo is one of the most delightful of Cervantes' works. Its two young vagabonds come to Seville attracted by the riches and disorder that the sixteenth-century commerce with the Americas had brought. There they come into contact with a brotherhood of thieves led by the unforgettable Monipodio, whose house is the headquarters of the Sevillian underworld. Under the bright Andalusian sky persons and objects take form with the brilliance and subtle drama of a Velázquez, and a distant and discreet irony endows the figures, insignificant in themselves, as they move within a ritual pomp that is in sharp contrast with their morally deflated lives. When Monipodio appears, serious and solemn among his silent subordinates, "all who were looking at him performed a deep, protracted bow." Rincón and Cortado had initiated their mutual friendship beforehand "with saintly and praiseworthy ceremonies." The solemn ritual of this band of ruffians is all the more comic for being concealed in Cervantes' drily humorous style. The romance of Persiles and Sigismunda, which Cervantes finished shortly before his death, must be regarded as an interesting appendix to his other works. The language and the whole composition of the story exhibit the purest simplicity, combined with singular precision and polish. The idea of this romance was not new and scarcely deserved to be reproduced in a new manner. But it appears that Cervantes, at the close of his glorious career, took a fancy to imitate Heliodorus. He has maintained the interest of the situations, but the whole work is merely a romantic description of travels, rich enough in fearful adventures, both by sea and land. Real and fabulous geography and history are mixed together in an absurd and monstrous manner; and the second half of the romance, in which the scene is transferred to Spain and Italy, does not exactly harmonize with the spirit of the first half. Some of his poems are found in La Galatea. He also wrote Dos canciones a la armada invencible. His best work, according to some critics, is found in the sonnets, particularly Al túmulo del rey Felipe en Sevilla. Among his most important poems, Canto de Calíope, Epístola a Mateo Vázquez, and the Viaje del Parnaso (Journey to Parnassus) (1614) stand out. The latter is his most ambitious work in verse, an allegory which consists largely of reviews of contemporary poets. Compared to his ability as a novelist, Cervantes is often considered a mediocre poet, but this has been dismissed by some critics—who recognize the importance and quality of Cervantes’ verse—as a poor evaluation. The prose of the Galatea, which is in other respects so beautiful, is also occasionally overloaded with epithet. Cervantes displays a totally different kind of poetic talent in the Viaje al Parnaso, a work which cannot properly be ranked in any particular class of literary composition, but which, next to Don Quixote, is the most exquisite production of its extraordinary author. The chief object of the poem is to satirize the false pretenders to the honors of the Spanish Parnassus, who lived in the age of the writer. But this satire is of a peculiar character: it is a most happy effusion of sportive humor, and yet it remains a matter of doubt whether Cervantes intended to praise or to ridicule the individuals whom he points out as being particularly worthy of the favor of Apollo. He himself says: "Those whose names do not appear in this list may be just as well pleased as those who are mentioned in it." Concealed satire, open jesting, and ardent enthusiasm for the beautiful are the boldly combined elements of this work. It is divided into eight chapters, and the versification is in tercets—four-line stanzas each line in iambic pentameter. The composition is half comic and half serious. After many humorous incidents, Mercury appear to Cervantes, who is represented as traveling to Parnassus in the most miserable condition; and the god salutes him with the title of the "Adam of poets." Mercury, after addressing to him many flattering compliments, conducts him to a ship entirely built of different kinds of verse, and which is intended to convey a cargo of Spanish poets to the kingdom of Apollo. The description of the ship is an admirable comic allegory. Mercury shows him a list of the poets with whom Apollo wishes to become acquainted and this list, owing to the problematic nature of its half ironic and half serious praises, has proved a stumbling block to commentators. In the midst of the reading, Cervantes suddenly drops the list. The poets are now described as crowding on board the ship in numbers as countless as drops of rain in a shower, or grains of sand on the seacoast; and such a tumult ensues, that, to save the ship from sinking by their pressure, the sirens raise a furious storm. The flights of imagination become wilder as the story advances. The storm subsides, and is succeeded by a shower of poets—poets fall from the clouds. One of the first who descends on the ship is Lope de Vega, on whom Cervantes seizes this opportunity of pronouncing an emphatic praise. The remainder of the poem, a complete analysis of which would occupy too much space, proceeds in the same spirit. Among the passages is the description of a second storm, in which Neptune vainly endeavors to plunge the poetasters to the bottom of the deep. Venus prevents them from sinking by changing them into gourds and leather flasks. At length a formal battle is fought between the real poets and some of the poetasters. The poem is throughout interspersed with singularly witty and beautiful ideas; it had no prototype and the style has not been duplicated since. The language is classical throughout; and it is only to be regretted that Cervantes has added to the poem a comic supplement in prose, in which he indulges a little too freely in self-praise. Comparisons have also diminished the reputation of his plays, but two of them, El Trato de Argel and La Numancia, (1582), made some impact, although they were easily surpassed by those of Lope de Vega and other Spanish playwrights of the day. The first of these is written in five acts; based on his experiences as a captive, Cervantes dealt with the life of Christian slaves in Algiers. The other play, Numancia is a description of the siege of Numantia by the Romans. These plays and interludes made up Ocho comedias y ocho entremeses nuevos, nunca representados (Eight Comedies and Eight New Interludes), which appeared in 1615. He also wrote eight short farces (entremeses), most of them in prose; they are his most highly-acclaimed dramatic efforts. Their dates and order of composition are not known, and they must not have been performed in their time. Faithful to the spirit of Lope de Rueda, Cervantes endowed them with novelistic elements such as simplified plot, the type of description normally associated with the novel, and character development. The dialogue is sensitive and agile. Cervantes includes some of his dramas among those productions with which he was himself most satisfied; and he seems to have regarded them with greater self-complacency in proportion to the neglect of the public. This conduct has sometimes been attributed to a spirit of contradiction, and sometimes to vanity. Cervantes was entitled to consider himself endowed with a genius for dramatic poetry, but he could not preserve his independence in the conflict he had to maintain with the conditions required by the Spanish public in dramatic composition; and when he sacrificed his independence, and submitted to rules imposed by others, his invention and language were reduced to the level of a poet of inferior talent. Cervantes's novel Don Quixote has had a tremendous influence on the development of written fiction; it has been translated into all modern languages and has appeared in seven hundred editions. It was first translated into English by Thomas Shelton in 1608, but not published until 1612, and subsequently into numerous other languages. It was enough though to give Shakespeare the basis of his lost 1613 work, Cardenio. Don Quixote has been the subject of a variety of works in other fields of art, including operas by the Italian composer Giovanni Paisiello, the French Jules Massenet, and the Spanish Manuel de Falla; a tone poem by the German composer Richard Strauss; a German film (1933) directed by G. W. Pabst and a Soviet film (1957) directed by Grigori Kozintzev; a ballet (1965) by George Balanchine; and an American musical, Man of La Mancha (1965), by Mitch Leigh. Its influence can be seen in the work of eighteenth century novelists like Tobias Smollett, Daniel Defoe, Henry Fielding, and Laurence Sterne, such classic nineteenth-century novelists as Sir Walter Scott, Charles Dickens, Gustave Flaubert, Herman Melville, and Fyodor Dostoevsky; and even on twentieth-century novelists such as James Joyce and Jorge Luis Borges. The theme also inspired the nineteenth-century French artists Honoré Daumier and Gustave Doré. History of "Miguel de Cervantes"
This page was last modified on 4 October 2018, at 15:25.